Broadcom and Other Suppliers Target Emerging Market for mPOS Devices Supporting NFC | NFC Times – Near Field Communication and all contactless technology. 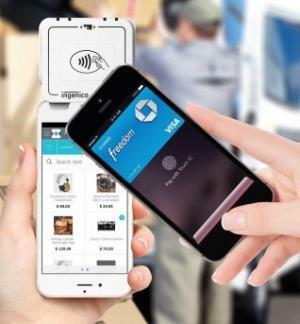 Vendors are targeting the market for mobile-POS terminals that can accept contactless cards and NFC-payment applications on smartphones, such as Apple Pay. Among the latest announcing products is POS terminal vendor Ingenico. Broadcom last week said its new line of microcontrollers with integrated NFC functionality, the BCM58100 family, will be able to securely read contactless cards and NFC applications on smartphones. Broadcom, which has mainly been a supplier to the NFC ecosystem of standalone NFC controllers for smartphones and other consumer electronic devices, claims its BCM58100 microcontroller is the industry's “first to integrate NFC for tap-to-access, tap-to-pair and tap-to-pay applications in a growing number of products.” Those products could include PCs and home-automation products, as well as mPOS terminals.